More kids born the 17th! Icthus VML Champagne Kiss kidded to adorable buckling/doeling twins on December 17th! Their sire is Dreamy-Hollow Parker - these are his first kids and I am very pleased with them! The picture is of all the kids... Maggie's are in the middle and the other two are Kiss'! Purebred Mini Nubian buck & first kids of the year born! 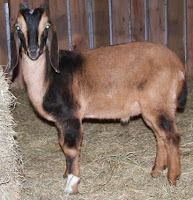 First off, we are now the owners of a Purebred Mini Nubian buckling - Faithful Acres Benjamin!! We are very thankful to Linda Finn of Faithful Acres Farm in Linden, TN for this beautiful future herdsire! Benjamin is a very nice buckling... everything you could ask for in a Purebred Mini Nubian! Thank you, Linda! I will hopefully get some better pictures taken of him soon. Also, the first kids of kidding season have been born! PawPawNin Maglio Tartuffini (we call her "Maggie") kidded on the evening of Tuesday, December 16th to adorable, tiny little buckling/doeling twins. They are both so small - about 3 lbs each :)! They are very colorful and so far look like some nice F2's! Pictures will be up hopefully tomorrow, if I have the time.